When it comes to healthcare construction of any kind, experience makes all the difference. Whether you want to renovate or upfit a medical building, create an addition, or build a new healthcare facility, understanding the details of a project is critical to its success. As a leading construction company and with 60 years behind us, Cunningham-Waters is a trusted source for your medical building construction project. Across South Carolina, North Carolina, and the entire southeast region, Cunningham-Waters has developed numerous medical facilities serving pediatricians, optometrists, medical labs, allergists, general physicians, surgeons, and other healthcare specialists. We are proud of our record of service to the southeast and count our many satisfied healthcare construction customers as a credit to our willingness to remain flexible and to work diligently to address your specific needs. Our medical building pre-construction process ensures that we comprehend your needs and enables us to deliver a quality healthcare construction project. Establish a budget. One of the most important parts of a medical building construction or medical renovation project is creating and adhering to a budget that you are comfortable with and that allows us to give you the end result you want. We will always provide the most cost-effective solutions for your healthcare project. Find an appropriate site. For new medical building construction, if needed, we will assist you with site selection and will help you find a real estate broker to handle the transaction. Determine the staff and office space needs for your building. We will talk with you extensively about your vision for your medical office and collect information regarding your staff size, office space needs, and other details about your healthcare business that will help us with your medical building construction or medical renovation project. Design your project. Our architect has worked alongside the Cunningham-Waters team to create many outstanding medical buildings. We will use his services to create a project perfect for you. And, with our computer-assisted design process, we will work with you on interior selections, from trim work to windows. This process also helps determine if any adjustments need to be made to the healthcare construction budget to accommodate any changes. Avoid unexpected surprises. 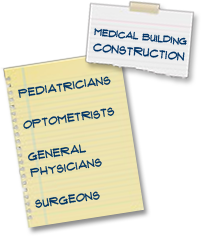 Our goal is for you to be completely satisfied with your medical building construction or medical renovation. We strive to remain within your budget, avoid any unexpected surprises, and meet our agreed upon completion date with a quality healthcare construction project that exceeds your expectations. A full-time superintendent. We are proud to have experienced healthcare superintendents on-site, managing every aspect of your medical building construction or medical renovation project and functioning as your go-to person for any question or issue that arises. Many of our superintendents have been with us for over 30 years. Safe operations. Our medical building construction team strives to maintain a safe working environment for all contractors and others visiting the site, and, in fact, we have won several awards for our excellent safety record. Our equipment. We are a turn-key healthcare construction company—we handle everything internally aside from electrical, plumbing, and HVAC, and we even own our equipment. This means we have a more efficient medical building construction and medical renovation process because we don’t have to waste time waiting for a loaned piece of equipment to arrive. Our flexibility. Our previous healthcare construction clients will say that we are easy to work with and flexible. If you decide to change something about your medical building project mid-construction, we will work with you to find a solution. Our team at Cunningham-Waters is ready to hear about your medical building construction or medical renovation project. As one of the leading construction companies in the Carolinas, we maintain the highest commitment to our healthcare customers and pride ourselves on our unmatched customer service and superior construction. Contact us about your healthcare construction needs or to see how we can meet your goals for a quality medical facility. **Please note that if you are not in a financial position to build at this time, we are willing to review your project plans and may consider a lease-purchase option.